BEAUTIFUL Czechoslovakian vase! Dramatically designed with a ruby red base and clear cased glass patterns, it is very unique. It also features a polished top and bears George Fenton's facsimile signature. 4737 4F Ruby Vase was made by Fenton Art Glass for their Horizons Series. To see more Horizons, Vases and Limited Editions. Golden Crown E&R Sweden beautiful mouth mouth blown bud vase. Dark Cherry red in color. Golden Crown sticker still attached. 5951 RL, Ruby Amberina Stretch Glass Cloverleaf Vase was made in 2003 by Fenton Art Glass. To see more Fenton Ruby Amberina Stretch Glass, and Limited Editions. UP FOR SALE is Now that the 1% have been dealt with. Gorgeous ruby red vase with base. This was made by Fenton Art Glass as a tribute to Frank Fenton. Hand painted dahlias. Sold exclusively on QVC (8/04). It was not in the regular Fenton line, making it a very limited edition. Mint in original box with included cards. C 09618, 100th Anniversary Founders Ruby Stretch Glass Flip Vase with Autumn Gold Base, was made by Fenton Art Glass as a tribute to Frank Fenton. Hand painted Dahlias by A Deem, this striking piece of art glass also has the 100th Anniversary Founders backstamp. Fenton 4962U7. The Heart Optic looks perfect in Fenton's handcrafted Ruby Opalescent 4-1/4" tall Rose Vase. in "Ruby Opalescent" Art Glass. 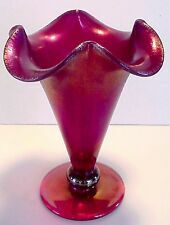 Classic Fenton "Ruby Opalescent" Art Glass. Prestigious and so Collectible! Bohemian Venetian Murano RUBY Vases Hand Painted Floral Enamel Gold 12"
New ListingJugendstil Bohemian Czech Art Nouveau Ruby Gold Vase Moser? Elegant Cranberry Red Glass embellished with Gilt and Gold Painted Design work. This Art Nouveau Vase appears to have never been used. It is a Bohemian Art Nouveau vase in remarkable condition. It is similar to Kosta Boda Bag / Sack vases by Kjell Engman. Great organic shape. Lots of bubbles in this layered glass vase with clear over red. The pontil has been ground and polished. See the photos. FENTON 8558JG. Connoisseur Collection for 2007. This tall, regal Ruby Glass pitcher features an applied crystal handle with a graceful arch. Ruby Glass. They began by painting decorations on glass blanks made by other glass manufacturers. It was made in 2007 by Fenton Art Glass for their Horizon Collection. Red Sparkle, Milk Glass, Mica & Ruby Glass combine in this retro style vase. Flecks of mirror-like mica are trapped between layers of white & ruby red glass. Hello Collectors, Here we have 1946-1947 Beacon Glass Co. Vineland New Jersey,Beautiful Hand Blown Glass Vase with a Wide Ruffle on Top. Acid satinised clear with flashed ruby bird and flora scene. The base has central snapped off pontil marks. Vase is 8" tall. Very fine delicate glass in good condition. Glass Sink, Glass Bowl.THIS IS Agorgeous HAND BLOWN GLASS VESSEL SINK W/A BEAUTIFUL MULTI COLOR DESIGN CAN BE USED W/A CONTEMPORARY DECOR BUT THE DESIGN,CREATED FROM BEING HAND BLOWN (no two r alike),GIVES IT A MORE TRADITIONAL AND FORMAL STYLE. Pattern: Diamond Optic. Era: 1940s. Vintage Blown Ruby Red Black Striped Spotted Studio Art Glass Vase 5"
LARGE c1970s VENETIAN Green Glass Vase GOLD GILT Jeweled Made in Italy Pedestal Vase. Normal wear on the gold gilt designs. 10" tall x 3" wide at base. Hand Blown red glass bottle / small vase. Studio swirls deco Ruby red glass. This elegant bottle/ vase is made in heavy high Quality ruby red art glass color glass. It is one of the most rare ,elegant & beautiful bottle a have ever see it. Personal collection or State sales, Flea Market, garage sales etc. 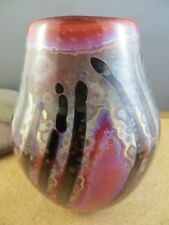 Fenton art glass by Dave Fetty vase called "Ruby Royale". Fenton item number 7070 QJ. Made in Spring of 2010. Limited and numbered #10 of 250. Hand blown to eliminate seams. Approximately 10 1/4” tall . No chips or cracks. Offered by former Fenton gold showcase dealer. Bowl dating to about c 1850. Featuring a Dark Red Color. Take a look at pictures for Details Before Buying. Hand made & unique Egermann 1389 Czech hand blown vase in luscious Ruby dark pink raspberry tone withheld applied flowers & finished in 24K Gold plating. Flowers look lovely in this vase, it is 12" tall & is the most comfortable size for flower bouquets. The glowing gem is a splendid ruby red color with a thick crystal base. Handblown art glass vase, 'Ruby Riches'. The talented Molinari Family artisans masterfully achieve the illusion with classic hand blown glass techniques. Many Italians immigrated to Brazil in the early 20th century, including families from the island of Murano near Venice. This auction is for a beautiful vintage,Antique ruby red with frosted glass vase.I believe this is bohemian glass.This has beautiful details in the frosted glass of a bird with leaves and vines.Very good condition no chips or cracks just inside one leave as I show in picture is a little pebble or seed.Measures 8 1/2 inches tall.If you have any questions or concerns please ask before you bid Thank You.Also take any reasonable offers. It has the Frank M Fenton Signature & marked SGS. To see more Fenton, Ruby Amberina Stretch Glass, and Limited Editions. Hand-blown Bud Vase. Weight: 1 lbs. This is for aFenton 7.5" Tuscan Charm on Ruby Amberina Stretch Vase. One of Fenton's most popular color combinations, red and gold is inspired by the designs and colors of Tuscany.Kim Barley's elegant floral design against a background ofRuby Amberina Stretch glass provides a beautiful combination of artistic styles. (Hand Blown leaded crystal with rough pontil. Production date not known, but probably contemporary. No signature or label. Mint- Like New or New; 2.). Excellent- Used but near new with very minor wear, if any (small scratches or abrasions which are not very noticeable) 3.). RUBY RED HOUR GLASS GOURD STYLE HAND BLOWN VASE in very good condition. Spike Hobnail. Ruffle Vase. Clean, intact. This square shaped ruby red vase has a clear base and clear corners. Narrower at the base and gradually increasing in size to the mouth, it has a modern feel with bold colors. This is for a beautiful and early set of Bohemian glass bottles in the famous grape vine pattern. They are quite early and carries pontil scars. It is one of a pair and one has a broken lip but that can be turned away. Vase is brighter, richer red than my images indicate. Height; 9 3/8". Good condition. A used item in good usable condition. The clear glass flows to ruby red to a rust or cinnamon color. It has a square base, that flares out then tapers back in toward the top and has a flower petal style top! Gorgeous appearance! It is not signed but it looks like Murano Art Glass. Jugendstil Bohemian Czech Art Nouveau Ruby Gold Vase Moser?